Games That Rock: Racin' Around the Whacky Tracks! HELLO GAMERS!!! Happy Friday to all of you in Xanaland!!! One of my favorite games, as a young gal, happens to be on my favorite system...for those of you that don't know, it's the SNES!!! That is by far, in this Queen's opinion, the greatest console ever!!! I must admit, I was slightly competitive as a child when it came to games. I hated to lose! Who doesn't? And as many of you may know, the Nintendo games are notorious for cheating. I remember violently thrashing my controller about, because after all, it was the controller's fault that I lost. My lack of timing nor constantly driving off track had absolutely nothing to do with my losing. Neither did having items thrown at me cause me to lose. That's just crazy talk! Today, I am going to share an oldie, but goodie. In fact, it's so good that there are now ELEVEN of this title. My favorite is still the one on the SNES though. 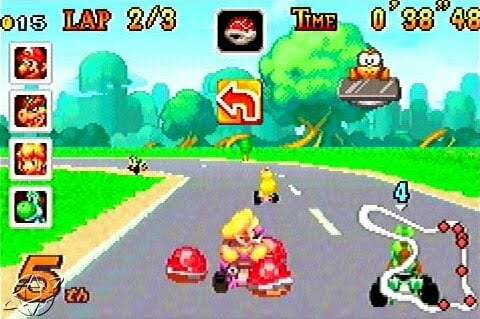 Super Mario Kart was released in 1992. For a sixteen bit, the graphics were amazing! The gameplay was simple, unless you were the target for the other racer's vengeance to claw their way into first place, which of course is the goal of the game. Having banana peels thrown at you when you are in first place is quite harsh. Curse those monkeys!!!! The empty Koopa shells flailing their way across the scene, trying so hard to hit you...that's just plain evil! At least there were those magic mushrooms to give you a boost! I loved the mushrooms! There were many good times spent playing this game. I remember becoming quite flustered at Bowser's Castle track. I spent more time crashing into the walls and falling into lava than I spent winning races. But that's the challenge that we seek when we play video games. I give this game 9/10 ROCKIN' STARS!!!! If you haven't played it, I suggest you get yourself a copy! You will not be disappointed! For those that have played this gem, what's your favorite track? Who is your favorite character to race as? I can't pick a track, but I was always Toadstool when I played.